Why do some traders prefer to spread trade versus trading outright futures contracts? The contracts often selected by the trader may be typically trading parallel to one another giving the trader only the “differential” moves between the two contracts. One may take any two markets that they observe have differentials between the price movement and take advantage of that spread! They may be legged in or put on as a spread trade (often with a reduced margin required for the spread). Often, traders may think that the risk is less than an outright future. This is a misconception! The spread trades are no less risky than an outright futures position. In fact, typically, you may watch it closely, but cannot put a stop-loss on a spread position. While technical entries may be difficult in outright futures, the spreads may move in sync with some fundamental factors that may reoccur at certain times of the year that affect the movement of the markets. What types of spreads are used in commodity futures spread trading? The Intracommodity Spread may also be regarded as a Calendar Spread whereby one would take the same commodity and trade two separate months against one another. An example would be the the Natural Gas spreads where a trader may want to buy a further out month and sell a nearby month reasoning that the demand from the season may create a need to buy the future month as storage may become depleted. These work well with grain markets as their carrying charges and seasonal tendencies may create that differential between two months. They may also be used strategically in the meat complex as producers may take their product to market. There are many more examples to go through, but this is not a report on calendar spreads specifically. The Intermarket Spread is a spread trade where one commodity may be spread against another from two exchanges. An example may be where the Kansas City Board of Trade Wheat may be bought and the Chicago Board of Trade Wheat may be sold in consideration of a potential higher demand of a hard red winter wheat as used for breads and pastries as opposed to the soft red winter wheat typically used in cakes. This particular spread is one that is not able to take advantage of any margin reductions usually. Commodity Product Spreads require more than two contracts of commodities to efficiently hedge or fulfill a specific need in the production of raw materials. Examples may be the Soybean Crush and the Energy Crack Spread. These are a bit more complicated, so I will defer this subject matter to a later report. The Intercommodity Spread is a spread between two different commodities, but in the same delivery month. Often this spread will set-up according to seasonality or occasionally a harvest supply/demand picture. The Intercommodity Spread is our focus for today! Specifically, we will analyze the merits of the Corn-Wheat Spread going into the 1st and 2nd quarter of 2011. This is a trade that I have monitored since the 80’s. I believe that it was first notable in the mid 60’s. The beauty of taking a classic trade and reviewing the trends and history of the trade saves time in research and previous observations may even save money on potential variances to watch for. In this particular spread, we note that July may be a strong month for corn as the weather conditions, plantings acreage, export numbers may still be unknown. The crop is still vulnerable until toward harvest which is in the fall. On the other hand, the harvest for the soft red winter wheat may be in July, allowing the market to regard the saturation of a harvested crop. One may look at the months; March, July and September contracts for this particular spread trade and select another, but this is the anatomy of the spread, not to be confused with a trade recommendation. As a matter of fact, this spread may be reversed at another time of the year. 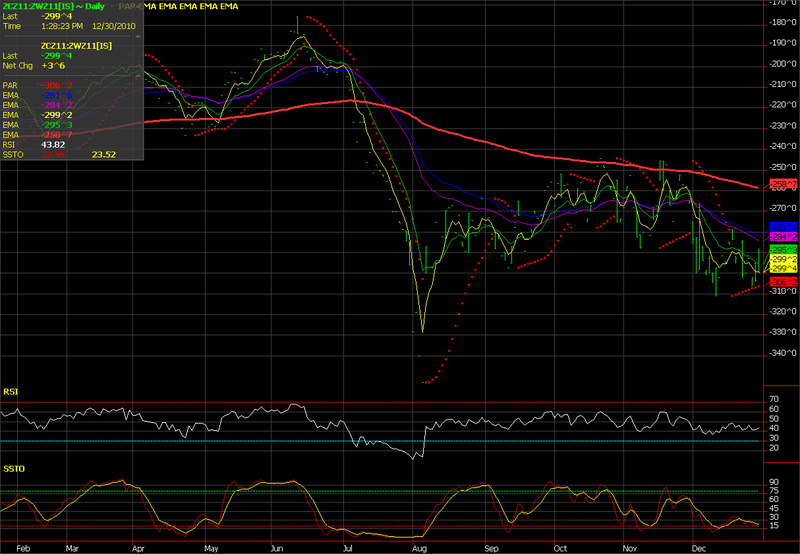 June may be a time frame to review the Wheat-Corn Spread. These grains are both feed product and may also be affected by livestock production trends, global supply-demand figures, weather conditions and basis for the farmer. The wheat is typically a heavier protein cereal, while corn does not vary to the extreme. In modern times patents on the seeds of varied grains has become big business. The USDA regulates the delivery, grades and contract size regular for delivery. The seeds and fertilizers must also endure disease and pests. There are Government Subsidy programs as well in some cases to control the crops being planted. In recent times, Africa has been know to lease land for crops to fulfill some of their required grain inventories in countries such as China. Technically, it is good to pull up a spread chart to monitor the merit of the potential move. One may select their Indicators to best confirm an entry. Buy 1 ZCZ11; while simultaneously Sell 1 ZWZ11 at market! One may simply subtract the two commodity prices to establish what the spread is trading at. Note: One must analyze the potential risk suitable for them and monitor this trade closely. It is suggested to exit the trade immediately once it penetrates the risk parameter. If profitable, it is suggested also to monitor the trade closely and potentially exit the trade by the 4th of July perhaps. This may also be transposed into an options trade! If you are a new trader, it is highly suggested that you work with your broker on the spread trades that you may have interest in. You must consider the commission and fees in strategizing any trade, but also note the value that a broker may have on the anatomy of a spread trade for you!